Although volunteers can be added on the Serving Tags page, the Add Volunteer page is useful as a quick way to add several records to a ministry tag where the Source and/or Notes for the tag are the same. So, let’s say you have several people who marked a communication card as interested in serving as a Greeter. 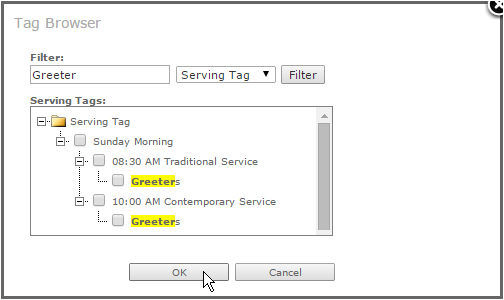 This is a quick and easy way to add those volunteers to the Greeter Serving Tag. The other advantage of having the Add Volunteer page is that it can be secured separately. This allows you to create a security role where a user is allowed to add volunteers but does not have access to modify the Serving Tags. 1. To get started adding volunteers, click the Add link. 2. Use the Person Search window to select records. NOTE: There is an option to Filter by Campus in the upper right-hand corner. 3. Click the Delete icon to remove a record from the “Add a new volunteer” process. This does not delete the name from the database; it only removes the name from the process of being assigned a Serving Tag. 4. Select the Source. The source specified here is assigned to all the individuals listed. 5. Click the Choose link to view the Tag Browser window. 6. Use the Tag Browser window to select the Serving Tags to be assigned. 7. Select the check boxes next to the Serving Tags then click the OK button. 8. Add any notes in the Comments text box. NOTE: The Comments display in the Notes section on the Tag Member Details page. 9. Click the button to add the volunteers to the Tags.